Dr. Darin Menlove, Director Study Abroad at UC Berkeley (Left) and Mr. Wasif Rizvi, President at Habib University (Right). HABIB UNIVERSITY: Dedicated to building an extensive network of international partners and collaborators, Habib University (HU) has entered several agreements with some of the most respected universities of the world. These agreements have helped enhance HU’s academic and non-academic offerings considerably, and opened new avenues of learning and collaboration for HU students and faculty. 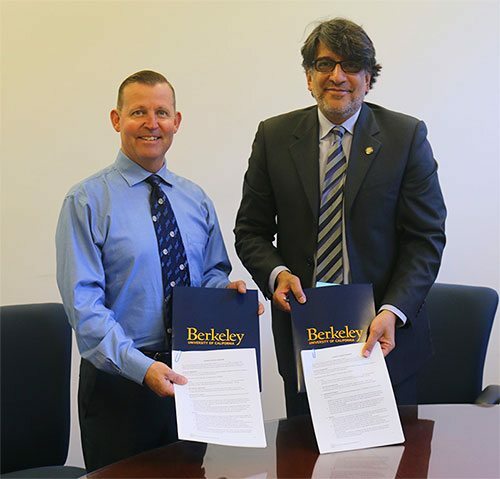 On Saturday, November 5, 2016, The Regents of the University of California – on behalf of the Summer Sessions Office of the University of California, Berkeley (UC Berkeley) – signed an agreement with HU to encourage HU students to apply for UC Berkeley’s Summer Sessions program. Summer Sessions at UC Berkeley are an opportunity for HU students to take classes with UC Berkeley and other domestic and international students. Multiple terms of differing lengths are being offered to students: for instance, students may choose to attend a six-week session, an eight-week session, or the entire 10-week term. Students will also be able choose what to study from a range of over 600 courses taught by UC Berkeley faculty, and have the option to reside on or off campus in the town of Berkeley, with easy access to downtown San Francisco. Under the arrangement, Habib University will screen and process applications from HU students who wish to enroll in the Summer Sessions program at UC Berkeley. During the internal selection process, each prospective student will have to display a serious intent to study, provide insights into the possible courses of study, and explain their learning expectations from the multicultural experience and the entrepreneurial potential of Silicon Valley and UC Berkeley. Habib University will provide information on course content and participation requirements to interested students. It will also assist students in selecting an appropriate schedule of classes; inform students about Berkeley campus housing options; and advise and assist students in securing the appropriate visa for their visit to the United States. UC Berkeley, often cited as the top public university in the United States and around the world, also hosts the annual Mahomedali Habib Distinguished Lecture Series on Pakistan under The Berkeley Pakistan Initiative. The lecture series was endowed by the founders of Habib University to “improve and diversify conversations about Pakistan in the United States as well as create opportunities for US and Pakistan-based scholars to dialogue,” according to the website for the Institute for South Asia Studies at UC Berkeley. The 4th Mahomedali Habib Distinguished Lecture is taking place on Sunday, November 6, 2016 from 3-5.00 P.M. local time in Berkeley. The lecture is titled “The Indus Civilization – Changing Perspectives on Regional Origins, Diverse Character and Complex Legacy”, and is being delivered by Dr. Jonathan Mark Kenoyer, famed archaeologist and one of the world’s leading authorities on the ancient Indus Civilization. The lecture will discuss the rapidly changing perspectives on the Indus Civilization that emerged in what is now Pakistan and Western India between around 2600-1900 BC.